Not to worry, the presentation is archived online. I think all educators need to start paying attention. The dynasty of the textbook is coming to an end. I was introduced to resources such as CK-12 Flexbooks, Connexions, OER Commons, CLRN Free Digital Textbooks, and the Flat Classroom Project. With all of these free or inexpensive, customizable resources - what it the draw of the typical textbook? Want to find some OER for yourself? Curriki lists 10 great OER search engines on their blog. Search Strategies - More than "Just Google It"
Every year, I ask my 6th grade students to respond to the following prompt in their Tech journals: "Describe your strategies for researching using the Internet." Without fail, at least 80% of them will respond with something like, "I type a word into Google and then click on the first website listed" or "I go straight to Wikipedia." Check the "About Us" to see if the site seems reliable. Sometimes "Contact Us" or "FAQs" or that site's own blog can also provide valuable hints to a page's reliability. Try searching -.com or +.edu. (ex: Twitter -.com) NOTE: There is no space between the "-" and the domain name type. Try subtracting or add words (for example type 'Tiger -Woods' to search for info on the animal.) NOTE: There is no space between the "-" and word you are subtracting. Try clicking on the little superscript numbers in Wikipedia articles to find out the source that is used. Or, just scroll down to the bottom of the Wikipedia article and look over all of the sources used. And, don't forget when you are searching to cite the websites you use! As a Technology teacher, I feel obligated to model good intellectual property habits for my students. The problem is, I am not completely clear on the rules myself! I am very thankful for the nonprofit Creative Commons site for helping me start to make sense of it all. However, I am trying to teach my students to forgo their typical Google Image search or pop song soundtrack and really start to think about intellectual property rights. I am no longer hiding behind the approaches: "well, we're not publishing it, so no one will notice" or "it's only a problem if you get caught." Copyright - [MOST RESTRICTIVE] Creative work is under copyright protection the moment it is created and "fixed in a tangible form." All sorts of creative work are protected including images, songs, and written work. People do not need to register with the Copyright Office to benefit from copyright protection, but the will need to if they ever plan on bringing suit against someone for copyright infringement. If a student wants to use copyrighted material in their presentation or website, they really need to contact the creator for permission. (My students do NOT like this rule.) I tell students that if the rights are not specified, assume it is copyrighted. Public Domain - [NO RESTRICTIONS] "When a work is in the public domain, it is free for use by anyone for any purpose without restriction under copyright law. Public domain is the purest form of open/free, since no one owns owns or controls the material in any way." Mostly, this includes resources that are government work (USGS, NASA) or very old. Cornell University has an updated table of copyright term and public domain rules. Creative Commons - [SOMEWHERE IN THE MIDDLE] This is a way to modify your copyright to allow for sharing, remixing or distribution of your work. There are many "levels" of creative commons licensing. 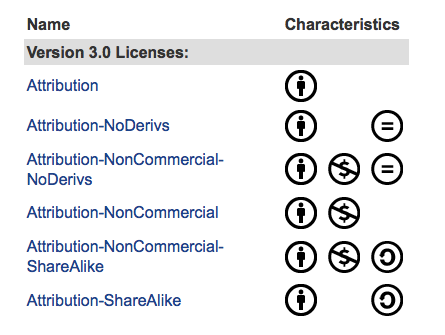 On this page, creativecommons.org lists them starting with the most accommodating license type through the most restrictive license type. Generally, the licenses address different requirements for attribution , share-alike commercial use, and allowing derivative works (can you modify it). There are four major conditions of the Creative Commons: Attribution (BY), requiring attribution to the original author (giving the author credit); Share Alike (SA), allowing derivative works under the same or a similar license (how you will license any work you create from it); Non-Commercial (NC), requiring the work is not used for commercial purposes (you can't make money from it; and No Derivative Works (ND), allowing only the original work, without derivatives (you can't change it). I know I have a lot left to learn, but at least I am encouraging my students to become aware of intellectual property rights and make it less likely that they will become "uninformed and unintentional plagiarists."